Description: A small Doto with no pigment spots on the cerata, but white glands are visible in the tips of the tubercles. The body and cerata have a light fawn or brown hue, and there is pale brown mottling on the head and back. 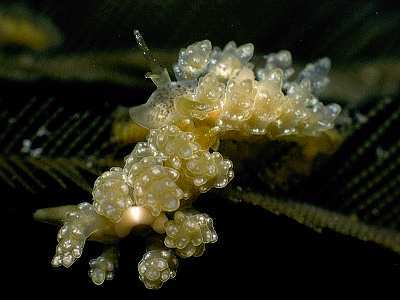 Habitat: Doto lemchei is a specialised feeder on Aglaophenia tubulifera, a plumulariid hydroid found mostly on rock surfaces in the circalittoral zone. The animals hide at the base of the hydroids but lay conspicuous spawn coils high on the stems. The spawn coil is short compared with most other Doto species, consisting of only two or three pleats. Distribution: Recorded from Galicia in NW Spain north to Rathlin Island on the north coast of Ireland. Fairly common at Skomer Is. and at some other localities in SW Britain. Lack of pigment spots on the tubercles. Brown hue to skin and pale brown pigment on the head and body. Picton, B.E. & Morrow, C.C. (2016). Doto lemchei Ortea & Urgorri, 1978. [In] Encyclopedia of Marine Life of Britain and Ireland.